Going to a restaurant can be quite frustrating–you wait for a table, you’re packed tightly next to strangers, and then you repeat the same overrated table service again and again. Thankfully, Barcelona’s finest culinary delights aren’t just prospering in restaurants, but these tasty bites are also thriving in Barcelona’s growing food truck scene. From savory vegan curry burgers to smoked pine mussel pate, the food trucks in Barcelona serve some of the city’s best street food. 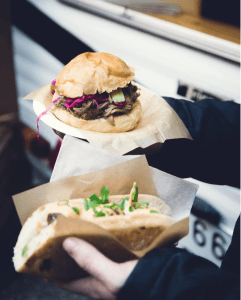 Beginning in 2014, Barcelona’s food truck trend has been rapidly growing to take street food to ridiculously new heights and to give people the ease of being able to enjoy these delicious dishes right on the curb. If you’re ready to chow down on heavenly, instagrammable street food, check out our picks for The Best Food Trucks in Barcelona. Yes, this truck is ALL vegan, and yes do they serve up some of the tastiest burgers in Barcelona! For you vegetarians and vegans seeking to feast your teeth into a juicy, plant-based burger, Vegetal Burguer escapes the overrated, traditional burger route by offering a smoked curry burger, a crumbly chorizo burger, and a sweet corn burger. If your belly isn’t hungry enough for a hefty burger, don’t worry, they have you covered with Japanese maki, multi-flavored muffins, and a potato omelette–all 100% vegan with the highest and freshest ingredients. 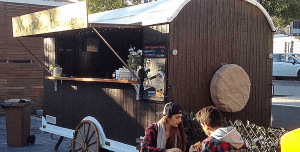 Their cosy restored wooden and metal food truck trailer will be beckoning to both vegans and non-vegans to get a taste of their unique gastronomy! Husband and wife team Carla and Buster Turner had no idea that their small rooftop smokehouse sitting atop their house would transform into Barcelona’s famous wonderland of smoky meat and fish, The Rooftop Smokehouse. Along with this restaurant sitting in the beautiful Fábrica Lehmann, their unique, smoking gastronomy is also thriving in their travelling food truck, featuring smoked mackerel pate, smoked breast duck ham, and other smoked delicacies that will leave your mouth watering over a whiff. If you’re hungering for a sweet wonderland to be present at your birthday or wedding, turn to La Creperie de Marione to transform your special event into a magical and fun atmosphere with a plethora of options from sweet and savory crepes, cupcakes, donuts, and many more. Their funky Volkswagen vintage caravan not only will give your party an original, vibrant touch, but if you find them outside of an event, their flamboyant food truck will give your Instagram photo that eccentric background your crepe needs. 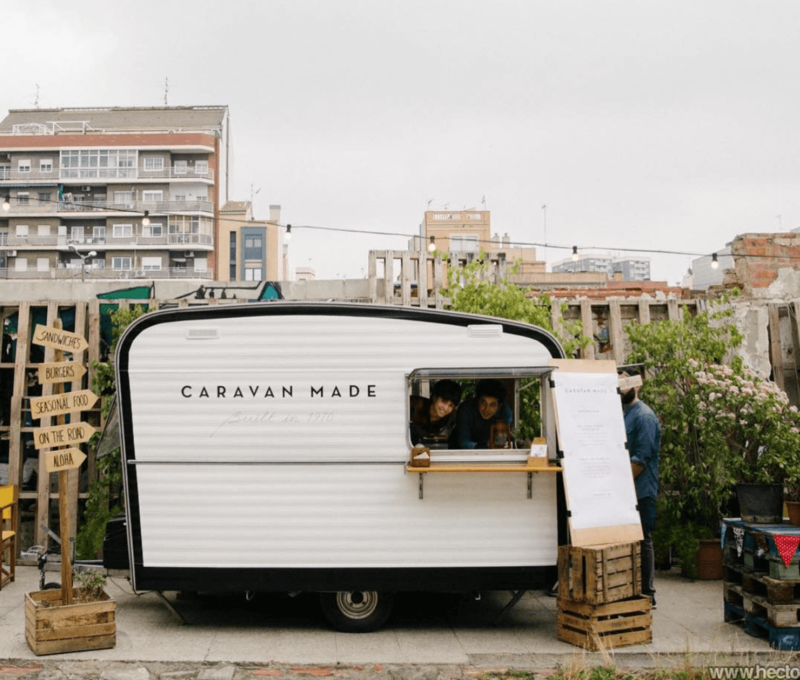 If you’re looking for a unique twist on the traditional bocadillo, take a trip to Caravan Made, an alternative culinary project based on the seasonal food of Barcelona where you can take a bite of their original gourmet sandwiches with natural and organic products. You can find this heavenly truck cooking in the streets of Barcelona’s favorite events and markets with their infamous Caravan burger, a fluffy brioche bread featuring a juicy veal burger and pepper mayonnaise, or their gooey grilled cheese sandwich with farmhouse bread, baked sweet potato, basil pesto, and a trip of melted cheese. If you surprisingly find yourself still hungry after scarfing down your sandwich, treat yourself to their renowned, velvety chocolate or lemon crumbs! If you’re hunting for a spot where you can unwind and relax from the excessive food you devoured at the food trucks, come to Skye Coffee to find coffee in its purest form in a ultracool converted 1972 Citoën HY. As a leading figure in the city’s thriving coffee scene, Skye Coffee minimizes the complexity of Barcelona’s traditional coffee options by letting the hard work and skills of the producer, roaster, and barista showcase the coffee’s true essence by only serving coffee as an espresso or with milk–no syrups, no spices, no cream. Not only can Skye Coffee give you the caffeine fix your body is craving, but it also functions as an epicenter for the creative community in the Poblenou district for anyone to join in on pop-up brunches, exhibitions, and to find a meditative meeting-place to find inspiration to fuel that creativity. Crafted with a love for food, animals, and the environment, Hanna Caravan serves vegans, vegetarians, and those looking for a healthier diet their interpretation of exciting cravable vegan street food using the freshest ingredients possible. Craving a crispy baked eggplant burger with parmesan? Or a creamy cheesecake? They have it all! 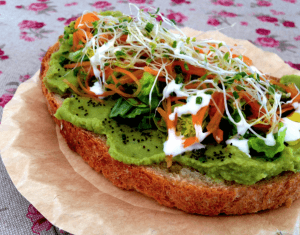 Their tasty and original vegan recipes go beyond the typical vegetarian trends or fashions to offer you mouth-watering plant-based dishes that’ll make you forget all about meat! If you’re ready to join in on the food truck trend, you can find these hidden gems on Foodtruckya, a website for the food trucks in Spain where you can check the up-to-date locations of the food trucks we listed above and many more! You can also follow these food trucks on Twitter or Facebook to stay updated on their locations and pop-up events! 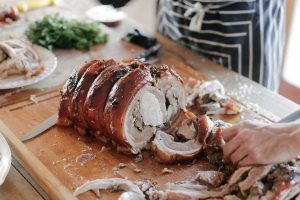 Whether you’re on the hunt for a new favorite lunch spot or you’re looking for a quick snack, you’ll want to make sure to pull over to get a bite out of these dishes because sometimes the best restaurants are on wheels!